All sales benefit the George Wright Society! Most guides to America's national parks concentrate on giving you travel tips: the prettiest places to take a photo, the best hikes, where to stay and how to get there. All of that is important information, but A Thinking Person's Guide to America's National Parks offers you something different—very different. This is a book for thinking people—people like you—who share a love for the American landscape, a deep curiosity about our nation‘s history, and a commitment to the stewardship of our national heritage. As a thinking person, you go to the national parks in search of inspiration and wisdom as well as enjoyment. To help you do this, we focus on the overarching themes—the big ideas—that bind the 400+ national parks into a national park system. Here, you will explore the vast canvas of fascinating ideas that are represented in the parks, ranging from the meaning of wilderness to the struggle for social justice to innovations in technology and more sustainable living. Together, the stories of the national park system challenge us in many ways, but they also offer us a sense of purpose and hope. In preparing this book, we’ve asked people with deep connections to the national parks to share their insights on an idea represented in the national park system that they believe is vital to its future. Chapters begin with a personal story of how the authors first connected to national parks and developed their passion for them. Drawing on their years of experience, the authors then discuss their topic, including the greatest challenges facing the national parks and important new directions for the national parks in the 21st century. Chapters close with the authors’ recommendations for parks and related areas where you can experience the main ideas in their chapter first-hand. With over 350 color photos covering nearly 300 of the parks, the book is a stunning visual journey as well. 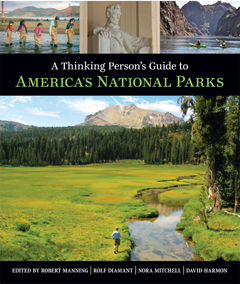 With A Thinking Person's Guide in hand, you will experience the national parks as never before. How is it that the United States-the country that cherishes the ideal of private property more than any other in the world-has chosen to set aside nearly one-third of its territory as public lands? Considering this intriguing question, Randall K. Wilson traces the often-forgotten ideas of nature that have shaped the evolution of America's public land system. The result is a fresh and probing account of the most pressing policy and management challenges facing national parks, forests, rangelands, and wildlife refuges today. Winner of the J.B. Jackson Prize. Millions of visitors tour America’s national parks, but few pause to consider when, why, or how the roads they travel on were built. This attractively illustrated new release from NPS historian Timothy Davis highlights the unique qualities of national park roads, details the factors influencing their design and development and examines their role in shaping the national park experience. Not only do park roads determine what most visitors see and how they see it, but deliberations about park road development epitomize the central challenge of the National Park Service’s Organic Act: balancing preservation and access in America’s most treasured landscapes. National Park Roads: A Legacy in the American Landscape tells this story in a manner that is accessible to general readers yet rich with insights for engineers, landscape architects, historic preservationists and others concerned with the stewardship of America’s natural and cultural resources and evolving attitudes towards nature, recreation and society. Follow Rosy Ralph as he sets off on an adventure to visit the spectacular U.S. National Parks. Children who hear the book may want go to a national park on their next vacation to see the things described in the book, which are all true. Rosy Ralph visits parks like Yellowstone, Yosemite, Acadia, Denali, Grand Canyon, and Great Smoky Mountains to see some of the their many wonders. The book also brings some attention to lesser known parks, such as Congaree, Biscayne, and the Gates of the Artic, where children can find excitement in seeing rare and unusual sites. This picture book features stunning illustrations by Lucy Elliot showing the parks and their wonders. These will capture a child's attention and get them interested in parks. Now in a fully updated edition, this invaluable reference work is a fundamental resource for scholars, students, conservationists, and citizens interested in America's national park system. The extensive collection of documents illustrates the system's creation, development, and management. The documents include laws that established and shaped the system; policy statements on park management; Park Service self-evaluations; and outside studies by a range of scientists, conservation organizations, private groups, and businesses. A new appendix includes summaries of pivotal court cases that have further interpreted the Park Service mission. When the Second World War began in 1939, more than 3.5 million Jews lived in Poland. By 1945, 90 percent of them would be dead. I Survived: My Name Is Yitzkhak presents the remarkable story of one man who made it out alive. Born in 1912, Yitzkhak (Isadore) Neiman began life as a handyman’s son in the rural village of Czuczewicze, on the eastern border of Poland. The town’s Jewish community and gentile farmers lived together in relative harmony until the war came to them in 1941. One year later, almost every member of the Neiman family would be dead, and only Yitzkhak’s conscription into the Russian Army would save his life. Interviewed by Dr. Harry Butowsky in the 1970s, Mr. Neiman narrates his service in two armies, imprisonment in a Soviet work camp, and escape to the United States in stunning, heartbreaking detail.elligence of regular people in extraordinary circumstances. call partners. As a national and international leader in the management of heritage places in collaboration with Aboriginal peoples of this country, Parks Canada believes that Aboriginal people must have access to places where they can continue to practice traditional activities and transmit their knowledge to the younger generation and to Parks Canada team members. Aboriginal partners in the management of heritage places, Parks Canada believes that in order for Aboriginal Knowledge to remain a strong and vibrant part of Aboriginal teachings, Aboriginal peoples must have access to places where they can continue to practice traditional activities and transmit their knowledge to the younger generation and to Parks Canada team members. Expanding Horizons summarizes the National Workshop on Large Landscape Conservation — the first major conference on large landscape conservation in North America. Over 650 conservation professionals came together to celebrate progress and share ideas on large-scale collaborations. The report stresses a multi-disciplinary, networked approach to finding solutions that benefit human, wildlife, cultural and ecological health. The summary includes a compelling and inspiring foreword by Tony Hiss, a New Yorker staff writer for more than 30 years. This user guide helps on-the-ground staff by providing succinct guidance, templates, and examples about integrating wilderness character. This document also aids staff in making responsible, transparent decisions that are consistent with USNPS policy. This handbook provides direction for creating wilderness stewardship plans driven by the concept of preserving wilderness character. Together, these documents create a structure for park-to-park sharing of experiences, ideas, and best practices to reach wilderness stewardship goals as quickly and efficiently as possible. As the National Park Service prepares for its centennial in 2016, this book provides an in-depth analysis of the role of philanthropy in national parks, with a focus on nonprofit organizations known as friends groups and cooperating associations. Providing a historical review of partnerships through the lifetime of the NPS, up to a contemporary analysis of the legal and organizational framework under which nonprofit philanthropic partners operate, the authors explore the challenges the NPS faces in dealing with nonprofit partners. This book provides a unique and informative review of the landscape in which philanthropic groups succeed—and sometimes fail. The third in a series describing the ambitious program to restore the ecological integrity of Canada’s national parks. Projects carried out by Parks Canada to improve the health of national park ecosystems are known as "Action on the Ground." This volume discusses the 36 Action on the Ground projects currently underway across Canada. Showcasing one species for each month of the year, including gray wolf, black bear, prairie dog, sea turtle, bison, bats, salmon, elk, beaver, American alligator, gray whale, and bald eagle, Vequist and Licht pair each premier species with a featured park, adding information about other parks where the species may also be readily seen and identifying other animals to look for in the same habitat—animals that prey, are preyed upon, or exist side by side with the focal species. Keiter explains how parks are changing to adapt to the environmental, economic, and demographic changes they face today. While national parks may be “the best idea America ever had,” Keiter argues that the national parks are not just one idea, but a blend of many ideas that have evolved, and are continuing to evolve, over the system’s hundred-year history. National parks can be wilderness areas, recreational playgrounds, tourist destinations, classrooms, native or tribal homelands, and more. By tracing the development of each of these goals over time, examining the controversies connected to them, and exploring what each goal means for parks in the future, To Conserve Unimpaired argues that a more complete understanding of the system and its history is paramount to thinking about what it means to conserve these places. Wildlife professionals can more effectively manage species and social-ecological systems by fully considering the role that humans play in every stage of the process. Human Dimensions of Wildlife Management provides the essential information that students and practitioners need to be effective problem sovlers. Edited by three leading experts in wildlife management, this textbook explores the interface of humans with wildlife and their sometimes complementary, often conflicting,interests. The book's well-researched chapters address conservation,wildlife use (hunting and fishing), and the psychological and philosophical underpinnings of wildlife management. The book is designed to help guide systematic and creative thinking about managing outdoor recreation. It begins by examining 1) the potential impacts of outdoor recreation on park resources and the quality of the visitor experience, and 2) management actions that might be applied to minimizing these impacts.It then builds a series of matrixes to help guide identification and application of management actions.The matrices are illustrated with a series of twenty case studies in diverse units of the national park system.The final chapter extracts a series of principles or best practices to guide outdoor recreation management in parks and related areas. The book is designed for both students and practitioners. Priznar and Doyle offer fresh sketches of the lives and accomplishments of 11 important American environmental leaders. George Melendez Wright is here, and the authors provide some new insights into the forces that shaped his short but influential life. So is Wright's ally, Ding Darling of the national wildlife refuges, and one of his heirs in activism, Marjory Stoneman Douglas, defender of the Everglades. Audubon, Marsh, Burroughs, Muir, Theodore Roosevelt, Pinchot, Leopold, and Carson round out the portraits. Parks Canada Aboriginal Affairs Secretariat; Nathalie Gagnon, ed. This collection of stories reflects Parks Canada’s vision of working together with Aboriginal peoples to ensure a more holistic stewardship of our natural and historical heritage that includes the cultural values and the knowledge of Canada’s First Nation, Métis and Inuit peoples. Canada is recognized as an international leader in working with Aboriginal peoples. Working Together: Our Stories showcases examples of successful projects where Parks Canada and Aboriginal partners have worked together to protect Canadian heritage. Jerry Freilich, Mark Huff, and Michael Liang, eds. Vital Signs Monitoring: Overviews" explains the “Inventory and Monitoring” program in the eight national parks comprising the North Coast & Cascades Network. Each chapter follows the NPS scientists who monitor the suite of "vital signs" that were selected as indicators of ecosystem health. The program will monitor glaciers, elk, fish, forests, birds and four other indicators far into the future so that parks can track their ecosystems and give timely warnings to managers. These lively articles, written by Emily Linroth and James Andrews, of the Western Washington University environmental journalism program, explain the work and the motivations of the scientists and technicians who brave the elements to do it. Gary E. Machlis, Thor Hanson, Zdravko Spiric, and Jean E. McKendry, eds. understanding the relationship between war and ecological systems. In this walking meditation, William Tweed, who worked among the Sierra Nevada’s big peaks and big trees for more than thirty years, hikes more than 200 miles along California’s John Muir Trail in a personal search for answers: How do we address the climate change we are seeing even now—in melting glaciers in Glacier National Park, changing rainy seasons on Mt Rainer, and more fire in the West’s iconic parks. Should we intervene where we can to preserve biodiversity? Should the parks merely become ecosystem museums that exhibit famous landscapes and species? Tweed weaves his experiences along this high-altitude trail together with reflections on the people and ideas that created the parks and on their status and meaning today. Studies in Outdoor Recreation: Search and Research for Satisfaction, 3rd ed. For twenty-five years, Studies in Outdoor Recreation has served as a standard text in college courses. It integrates social science literature on outdoor recreation by reviewing studies from this broad, interdisciplinary field and synthesizing them into a body of knowledge, providing an historical perspective on outdoor recreation research and developing its practical management implications. The third edition is revised to reflect current research and new concerns in the field. A new chapter examines the emerging issue of sense of place and its relationship to outdoor recreation. The book concludes with twenty principles to guide outdoor recreation management and research. An extensive bibliography and section entitled “Notes on Sources: A Guide to the Social Science Literature in Outdoor Recreation” lead readers to valuable primary source material. The central concept guiding the management of parks and wilderness over the past century has been “naturalness”—to a large extent the explicit purpose in establishing these special areas was to keep them in their “natural” state. But what does that mean, particularly as the effects of stressors such as habitat fragmentation, altered disturbance regimes, pollution, invasive species, and climate change become both more pronounced and more pervasive? Beyond Naturalness brings together leading scientists and policymakers to explore the concept of naturalness. It concludes that while naturalness will continue to provide an important touchstone for protected area conservation, more specific goals and objectives are needed to guide practical stewardship. Policy options and institutional implications are explored. This groundbreaking book—now reissued with a new preface and epilogue that bring the book up to the 2009 change in presidential administrations—traces the epic clash of values between traditional scenery-and-tourism management and emerging ecological concepts in America’s national parks. “One of the most important books ever written on the realities of biological conservation. It should be required reading for anyone interested in national parks.” — DAVID J. PARSONS, Aldo Leopold Wilderness Research Institute, U. S. Forest Service. “An indispensable book on the history of biological conservation in the national parks.” — WILLIAM CRONON, author of Changes in the Land. Wildlife and Society is uniquely comprehensive in its approach to presenting the past, present, and future of human dimensions of fish and wildlife research and application. It offers perspectives from a wide variety of academic disciplines as well as presenting the views of practitioners from the United States, Europe, Africa, and Latin America. It is an important new reference for anyone concerned with fish and wildlife management or environmental conservation and protection. This book presents a science-based approach to outdoor recreation management at Acadia National Park, applicable to parks and conservation areas nationwide. The book describes fifteen years of research at Acadia, conducted by Robert E. Manning, his colleagues, and students. The book is organized into three parts. Part I addresses indicators and standards of quality for park resources and the visitor experience. Part II describes efforts to monitor indicator variables. Part III outlines and assesses management actions designed to maintain standards of quality. The book concludes with a discussion of the implications of this program of natural and social science research, including a series of principles for outdoor recreation management at Acadia and other parks and conservation areas. Many Americans think of national parks and wilderness as synonymous, yet they are not. This word has taken various meanings and influenced policy in various ways throughout the history of the national park system. The book traces that history examining how and why the National Park Service has had such a struggle addressing formal wilderness in its policy and management. Despite its reluctance to embrace “zoning” parks for wilderness, its opposition to the Wilderness Act, and its difficulties recommending wilderness as mandated by the Act, it is today the world’s preeminent wilderness steward. The author attempts to explain how the NPS has protected wilderness in spite of itself. A complete Isle Royale nature guide that describes all the common flora and fauna of the island in a full color, compact book. “At last the common flora and fauna of Isle Royale are collected in this one easy-to-use and easy-to-carry volume! Island Life provides park visitors with answers to many of their ‘what was that?’ questions and handy ways to identify and appreciate the mammals, birds, fish, reptiles, trees and flowers of this unique island community." --Liz Valencia, Chief of Interpretation, Isle Royale National Park. On the morning of December 7, 1941, life for families across America was forever changed by events over which they had no control, but were to witness and play a part. An American Family in World War II is the story of one of those families — told largely in their own words. When Ralph "Lee" Minker Jr. entered U.S. Army Air Cadet training in 1943, he began a correspondence with his parents and two teenage sisters; letters that describe the rigors of pilot training and ultimately his life at "this air base I call home," as he flew 37 combat missions over Nazi Germany. The letters from the family members to Minker bring a vibrant reality to the home front — "rationing, bond drives, and the daily tension of war" — through the people who lived it. A comprehensive review of one of the most important US conservation laws. As the title suggests, the Antiquities Act is remarkable for cutting across cultural and natural resource concerns. This collection covers the historical development of the Act, its implications for various disciplines, and future horizons. A complete list of all national monuments created under the Act is included as an appendix. Winner of State of New Mexico's 2006 Heritage Preservation Award in the category of Heritage Publication. This book traces the history of San Francisco's park system, from the earliest city plans, which made no provision for a public park, through the private garden movement of the 1850s and 1860, Frederick Law Olmsted's early involvement in developing a comprehensive parks plan, the design and construction of Golden Gate Park, and finally to the expansion of green space in the first third of the twentieth century. Young documents this history in terms of the four social ideals that guided America's urban park advocates and planners in this period: public health, prosperity, social coherence, and democratic equality. This volume focuses on the integration of communities into decision-making about forests. It considers the connection between forests and communities from a variety of perspectives, including environmental history, natural resource sociology, and forest policy, to show that forests are as much a social institution as they are a biological resource. Conservation Across Borders presents a broad overview of the history of transboundary conservation efforts. Through detailed examinations of two initiatives, the International Sonoran Desert Alliance (ISDA) and the Yellowstone to Yukon Initiative (Y2Y), the book helps readers understand the benefits and challenges of landscape-scale protection. In addition to discussing general concepts and the specific experience of ISDA and Y2Y, the author considers the emerging concept of "conservation effectiveness" and offers a comparative analysis of the two projects. The book ends with a discussion of the complex relationships among civil society, governments, and international borders. First a history of the establishment, management, and conservation issues of the site, Cumberland Island National Seashore also serves as a revealing look at the ongoing national battle between ecosystem preservation, historic conservation, and lingering private use in the park system. Dilsaver uses the island as an example of the difficulty of converting privately owned lands into public space. The fate of the island has galvanized national environmental groups, the descendants of powerful families, historic preservation organizations, and African American heritage societies. Just as the restoration of Michelangelo's Last Judgment sparked enormous controversy in the art world, so are environmental restorationists intensely divided when it comes to finding ways to rehabilitate damaged ecosystems. The same question confronts artistic and environmental restorationists: Which systems need restoring, and to what states should they be restored? Earth Repair explores the answer to this question while offering an alternative to the usual narrative of humans disrupting and spoiling the earth. David E. Newsome, David N. Cole and Jeffrey L. Marion, Environmental impacts associated with recreational horse riding. Jeffrey L. Marion and Yu-Fai Leung, Environmentally sustainable trail management. Yu-Fai Leung and Jeffrey L. Marion, Managing impacts of campsites. David N. Cole, Impacts of hiking and camping on soils and vegetation: a review. All forms of tourism have impacts on the natural environment. The impacts of ecotourism tend to be concentrated in areas of highest conservation value, hence the need to manage and minimize these. The book considers impacts of particular activities, such as hiking and camping, off-road vehicles, and recreational boats, and impacts specific to certain ecosystems (e.g. marine environments, polar coasts, mountain environments). It incorporates reviews of better-studied impacts by well-known experts; and case studies of recent research and less well-known issues. Written by many of the foremost authorities on the subject, this comprehensive volume is the first to synthesize our knowledge of the science, ecology, and management of fire in California. Part I includes an historical overview of fire, vegetation, and climate in California; overviews of fire as a physical and ecological process; and reviews the interactions between fire and the physical, plant, and animal components of the environment. Part II explores the history and ecology of fire in each of California's nine bioregions. Part III examines fire management in California, including both Native American and post-European settlement; discusses current issues related to fire policy and management, including air quality, watershed management, invasive plant species, native species, and fuel management; and considers the future of fire management. Gem of the Adirondacks tells the story of the Benson Mines and the effects of the growth of iron mining and its ultimate abandonment on Star Lake and surrounding communities. The author worked in the Benson Mines plant for several intervals between 1961 and 1966. His extensive research has been supplemented by access to some unique photographs and documentary material. The History of the Central Brooks Range uses rare primary sources in order to provide a chronological examination and history of the Koyukuk region -- including anthropological descriptions of the Native groups that make the Central Brooks Range and its surroundings their home. The history of early exploration, mining, and the Klondike all overflow into the story of the Koyukuk region and its rich cultural heritage, and Brown provides a fascinating history of the extraordinary ways of survival employed by pioneers in this rugged northern land. The book examines the historical, scientific, political, legal, and institutional developments that are changing management priorities and policies on the public lands — developments that compel us to view these lands as an integrated ecological entity and a key biodiversity stronghold. It includes chapters on the emergence of ecosystem management principles, new preservation challenges, and collaborative conservation initiatives. Arguing that we must integrate the new imperatives of ecosystem science with our devolutionary political tendencies, the book outlines a coherent new approach to natural resource policy for the 21st century. In the early 1950s, three decades before the battle over oil development in the Arctic Refuge began, a group of visionary conservationists launched a campaign to protect northeast Alaska as an archetypal wilderness. Last Great Wilderness examines the interwoven set of tangible and intangible values — cultural, spiritual, and symbolic as well as wildlife, ecological, and recreational values that underpinned the campaign. As it traces the beginnings of a landmark conservation unit of unprecedented size and purpose, the story that unfolds chronicles the evolution of the wilderness concept during a pivotal period of American environmental history. Managing Mountain Protected Areas presents experience from around the world on a diverse set of issues related to the special circumstances of managing PAs in mountainous areas. Among the subjects are landscape-level inititatives, corridors, transboundary PAs, biodiversity, partnerships, wilderness, recreation, visitor impacts, and financing, among others. The book originated in a workshop held in South Africa's Drakensberg mountains in conjunction the 2003 World Parks Congress. The most comprehensive park management book ever written, Managing Protected Areas is a massive compilation of best practices from around the world. It is the work of IUCN's World Commission on Protected Areas, a worldwide voluntary network of park professionals. Dozens of figures, tables, and text boxes augment chapters that range from biodiversity protection to the intangible values and benefits of parks. The Maya Tropical Forest, which occupies the lowlands of southern Mexico, Guatemala, and Belize, is the closest tropical rainforest to the United States. Writing for both park visitors and conservationists, James Nations presents a natural history that profiles the forest's significant animals and plants, then describes the Maya peoples, national parks, and major archaeological sites in Mexico, Guatemala, and Belize. Drawing on more than twenty-five years of conservation work in the Maya Tropical Forest, Nations tells first-hand stories of the creation of national parks and other protected areas to safeguard the region's natural resources and archaeological heritage. In the years following World War II, Americans visited the national parks in unprecedented numbers, yet Congress held funding at prewar levels and park conditions steadily declined. To address the problem, in 1956 a ten-year, billion-dollar initiative titled "Mission 66" was launched, timed to be completed in 1966, the fiftieth anniversary of the National Park Service. Mission 66 was controversial at the time, and it continues to incite debate over the policies it represented. Carr's book examines the significance of the Mission 66 program and explores the influence of midcentury modernism on landscape design and park planning. National Parks and Protected Areas: Approaches for Balancing Social, Economic and Ecological Values is peerless in its unified treatment of the issues surrounding the "new direction" being taken to cope with the internal and external forces impinging on protected areas. From decision-making for planning and management to the principles of ecology and economics, this text examines the analytical methods, information technologies, and planning and management problems associated with protected areas. Protected area managers, as well as students in undergraduate and graduate courses in natural resource management, will appreciate this highly readable book. Protected Area Management: Principles and Practice examines the multi-disciplinary task of managing protected areas. This second edition of this authoritative text has been updated, expanded, and includes new Australian and international case studies. Part A explains the environmental, social, political and historical context of management; Part B examines in depth the main principles and practices of management, including obtaining and managing information; planning; administration; economics; natural heritage; cultural heritage; incidents; tourism and visitor management, indigenous peoples and protected areas, and managing for the future; and, Part C is a state-by-state summary of protected areas. The traditional patterns of land use that have created many of the world's cultural landscapes contribute to biodiversity, support ecological processes, provide important environmental services, and have proven sustainable over the centuries. Protected landscapes can serve as living models of sustainable use of land and resources, and offer important lessons for sustainable development. This book presents examples of these landscapes and the diverse strategies needed to maintain this essential relationship between people and the land. In the 1990s, influenced by the deconstructionist movement in literary theory and trends toward revisionist history, a cadre of academics and historians began raising provocative questions about ideas of wilderness and the commitments and strategies of the contemporary environmental movement. While these critiques challenged some cherished and widely held beliefs -- and raised the hackles of many in the environmental community -- they also stimulated an important and potentially transformative debate about the conceptual foundations of environmentalism. Reconstructing Conservation makes a vital contribution to that debate, bringing together 23 leading scholars and practitioners to examine the classical conservation tradition and its value to contemporary environmentalism. The first systematic, multidisciplinary assessment of the "Crown of the Continent Ecosystem," an area covering northwestern Montana, southwestern Alberta, and southeastern British Columbia, and whose centerpiece is a complex of wildlands that includes Waterton-Glacier. As the economic base shifts from resource extraction to tourism and residential growth, new policies for managing growth and economic transformation are required. Contributors to this book offer a variety of perspectives and proposed solutions. Originally published in 1982 to celebrate the new and expanded national parks in Alaska, this re-release is in honor of the 25th anniversary of the Alaska National Interest Lands Conservation Act (ANILCA).Â Each of Alaska's national parks is described and augmented through excerpts and quotes about the natural and cultural heritage of the park. President Jimmy Carter contributed a preface for the 2005 release in honor of the historic land conservation act that bears his signature. With fresh photographs and a new elegant design complimenting William Brown's lyrical writing, this book is a keepsake for anyone who loves Alaska's national parks. More than 25 leading thinkers in the field of fire ecology provide in-depth analyses, critiques, and compelling solutions for how we live with fire in our society. Using examples such as the epic Yellowstone fires of 1988, the ever-present southern California fires, and the Northwest's Biscuit Fire of 2002, the book examines the ecology of these landscapes and the policies and practices that affected them and continue to affect them, such as fire suppression, prescribed burns, salvage logging, and land-use planning. Overall, the book aims to promote the restoration of fire to the landscape and to encourage its natural behavior so it can resume its role as a major ecological process. In terms of size and diversity, America's publicly-owned wildlands have few worldwide rivals. These places reflect the values of the people who create, use, manage and support them. As such, America's wildlands are dynamic socio-biological systems that evolve and change in response to human needs, societal values and political forces. Wildland Recreation Policy is not only about how our system of wildlands came to be, but also the political process by which we decide how these places should and should not be used. Our intent is to build a knowledge structure for creating responsive agencies and policies, the cornerstones of conflict resolution in wildland recreation. Highly regarded but often misunderstood, the wolf has as many friends as enemies, and its reintroduction into Yellowstone National Park has sparked both fascination and controversy. This comprehensive reference documents the prehistory, management, and nature of the Yellowstone wolf. Historian-naturalist Paul Schullery has assembled the voices of explorers, naturalists, park officials, tourists, lawmakers, and modern researchers to tell the story of what may be the most famous wolf population in the world. All royalties from sales of this book go to Yellowstone's wolf recovery project.